Russia's UN Ambassador Vassily Nebenzia called a 30-day ceasefire unrealistic, and diplomats said during negotiations on the text he argued that it couldn't be enforced. 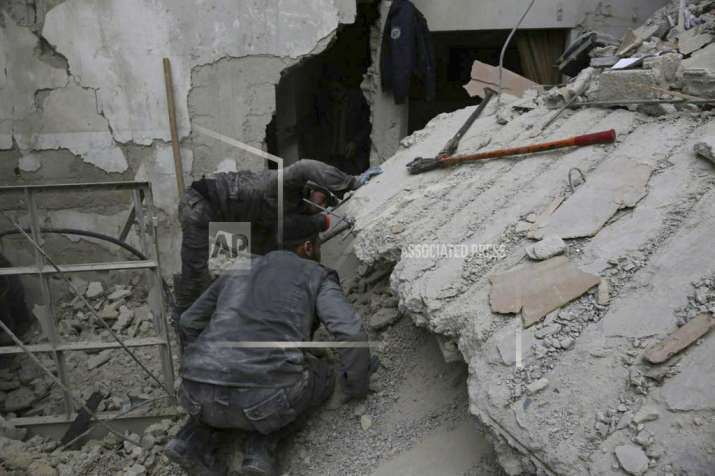 In this photo released on February 21, 2018 which was provided by the Syrian Civil Defense group known as the White Helmets, shows a member of the Syrian Civil Defense group, searches for victims under the rubble of a destroyed house that attacked by Syrian government forces airstrike, in Ghouta. Sweden and Kuwait called for a vote on Thursday on a UN resolution ordering a 30-day ceasefire throughout Syria to enable delivery of humanitarian aid to millions of people in acute need, and the evacuation of the critically sick and wounded. But the Security Council resolution would exempt attacks directed at extremists from the Islamic State group, al-Qaida and the Nusra Front — targets the Syrian government and its Russian allies say they are pursuing. The proposed resolution, put in a final form on Wednesday, expresses "outrage at the unacceptable levels of violence" and attacks on civilians in several parts of Syria, particularly in Idlib governorate and the rebel-held Damascus suburbs of eastern Ghouta. Whether Russia uses its veto or abstains in a vote on the resolution remains to be seen. Russia's UN Ambassador Vassily Nebenzia called a 30-day ceasefire unrealistic, and diplomats said during negotiations on the text he argued that it couldn't be enforced. Instead, he proposed a change that would have the parties agree to a ceasefire themselves which was rejected by the sponsors, the diplomats said. "We cannot simply decide that there is a cease-fire," Nebenzia said on Wednesday in an audio recording from Russia's UN Mission. "That's a long and complex process to achieve. Cessations cannot be established by putting a word in the resolution." Soon after final draft of the resolution was circulated, Nebenzia called for an open Security Council meeting Thursday on eastern Ghouta. Some diplomats complained privately that Russia was trying to delay action on the 30-day ceasefire resolution. The UN human rights office said Wednesday that at least 346 people have been killed in eastern Ghouta since the Syrian government and its allies escalated an offensive on February 4. Nebenzia told the council it's important that all sides in the conflict present their understanding of the situation in eastern Ghouta "and come up the ways of getting out of the situation there." Russia understands "there are terrorists there who the Syrian army is fighting and the terrorists are shelling heavily Damascus — and that has been neglected," he said. Secretary-General Antonio Guterres earlier urged an immediate suspension of "all war activities" in eastern Ghouta, where he said 400,000 people are living "in hell on earth." The UN chief said a suspension of fighting must allow for humanitarian aid to reach all in need and the evacuation of some 700 people needing urgent medical treatment. "This is a human tragedy that is unfolding in front of our eyes and I don't think we can let things go on in this horrendous way," he said. US Ambassador Nikki Haley supported the UN chief saying "it is time for us to realize that we can't continue to look away." Later, she accused "the barbaric Assad regime" of attacking men, women and children. "It is simply preposterous to claim that these attacks on civilians have anything to do with fighting terrorism," Haley said in a statement. "The Security Council must move to adopt a resolution establishing a cease-fire." But since the Syrian conflict began nearly seven years ago, the Security Council has been deeply divided, with Russia backing President Bashar Assad's government and the US, Britain and France supporting the opposition. The result has been paralysis and inaction. The proposed Syria humanitarian resolution drafted by Sweden and Kuwait expresses "grave distress" that more than 13.1 million people in Syria need urgent humanitarian assistance and "outrage" at the escalating violence and lack of access to civilians in need. It calls for a cease-fire throughout Syria to begin 72 hours after the resolution's adoption. It states that 48 hours after a ceasefire starts humanitarian convoys must be allowed "unimpeded and sustained access" and the UN and its partners must be allowed to evacuate urgent cases. The draft resolution also calls for the immediate lifting of sieges including in eastern Ghouta, Yarmouk, Foua and Kefraya.